← BREKKIE IN MELBOURNE ANYONE? Here’s a fun game day main dish or just for an every day dinner for football fans. It has the addition of carrots to add just a little bit more of a nutritious punch. You can also shred vegetables like zucchini and add them if you’d like. Try the recipe in the ad (circa 1950s) if you’re feeling adventurous, otherwise, I recommend the updated version below. Enjoy watching the game and eating this healthy meatloaf! Your guests will never know it’s good for them! In a large bowl, add ground turkey, oats, carrot, onion, egg white, Worcestershire, horseradish, salt and pepper. Work the ingredients with your hands until they are well combined and stick together well. 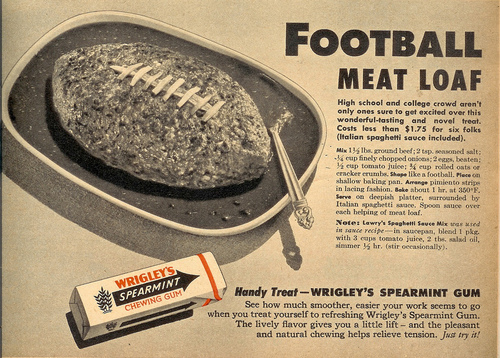 On a non-stick oven safe pan, shape the loaf into a football shape. Make a well on the top of the meat where the ketchup and onion decoration will go. Add ketchup to fill the well you created. Top with thin slices of onion, arranged to look like the football’s laces.